The home of Nottinghamshire CCC will host five group matches at the ICC Men's Cricket World Cup 2019. First opened in 1841, Trent Bridge is a truly historic cricket ground. It first hosted a one-day international in 1974 and has been used as a Cricket World Cup venue for the 1975, 1979, 1983 and 1999 editions. 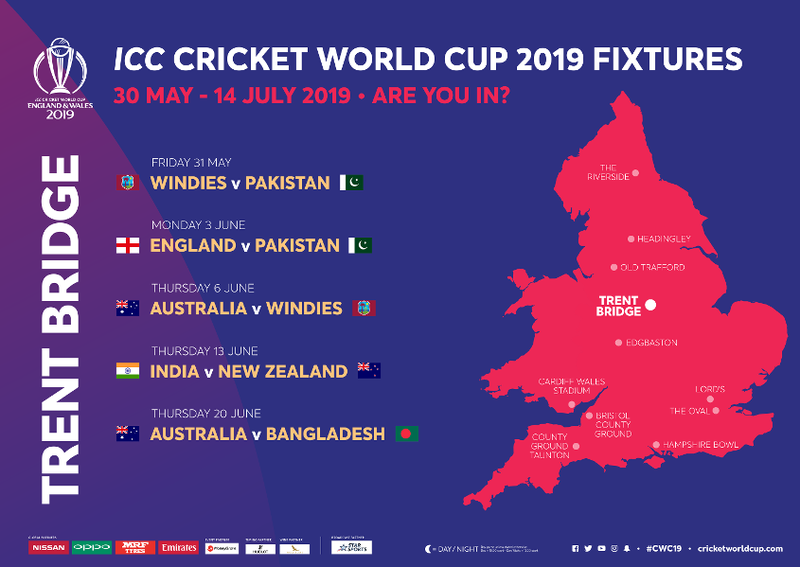 At the ICC Cricket World Cup 2019 it will host five matches, including England v Pakistan. Hosts England have a great record at Trent Bridge, having won both their previous World Cup games at the venue: wins against New Zealand in 1975 and Zimbabwe in 1999. Trent Bridge, which is the home of Nottinghamshire - was the venue where England recently set a record ODI score of 481/6, with Alex Hales and Jonny Bairstow both making centuries. It was also the ground where they previously set the record in 2016, when they scored 444/3. To find out more about the accessible facilities and services at Trent Bridge, check out the CWC19 Access Guide here. Plan ahead so you can make the most out of your day at Trent Bridge during the ICC Men’s Cricket World Cup 2019. Trent Bridge is located 1 mile from Nottingham Train Station and approximately 1.5 miles from Nottingham city centre. The ground is only a one-mile walk from the train station and is also well served by a number of local buses which drop just outside of the ground. There is no official match day parking available offered by the venue. However, there is a large parking area at Victoria Embankment which has space for up to 2,000 cars and is 0.7 miles from the ground, operated by Nottingham City Council. There is a limited number of blue badge parking spaces available at the venue which are booked on a first-come, first-served basis. These are booked directly with Trent Bridge. Booking information coming soon. To plan your tram journey in Nottingham please see www.thetram.net/route-planner for further information. All of the buses which operate between Nottingham Station and Trent Bridge are accessible buses. The buses which stop along Bridgford Road provide the easiest and most direct route to the ground. Nottingham Station is the closest train station to the ground and is well served by local, regional and national services. The station has many entry and exit points and we recommend all first-time visitors to the station to follow the signs which direct them to Carrington Street. This will lead you to the station’s ticket hall where our World Cup Cricketeers will be able to guide you to the ground. Nottingham Station is an accessible station and if you do require assistance please make this known with your rail operator so they can ensure that you have a safe and comfortable journey. There is no official drop-off and pick-up location for Trent Bridge, however it is recommended to avoid driving near the venue on a match day due to the extra congestion and activity associated with the match. There are safe places to drop off and pick up in West Bridgford which is around 400m from the ground. Trent Bridge is located in the borough of West Bridgford which is 1 mile from Nottingham Station and 1.5 miles from Nottingham city centre. There will be an official walking route from the station to the ground which will be signposted and our World Cup Cricketeers will cheer you on the way. At present there is no cycle parking at Trent Bridge. The nearest secure cycle parking is located at the West Bridgford Library. Probably best known for its associations with the legendary Outlaw - Robin Hood and Nottingham Castle (currently closed for development until 2020), the city is also famous as the once-centre of the lace making trade as well as for the tobacco industry and cycle manufacture. 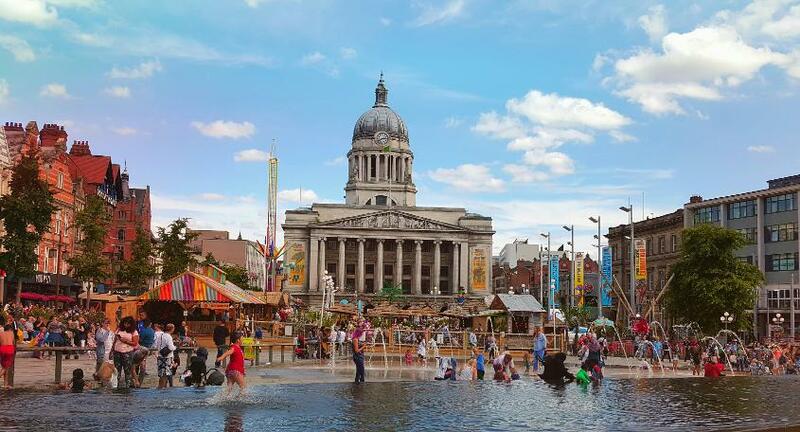 Nottingham was named a ‘City of Literature’ by UNESCO in 2015, reflecting Nottingham's literary heritage; with Lord Byron, D. H. Lawrence and Alan Sillitoe having links to the city. Its universities, the University of Nottingham and Nottingham Trent University, are attended by over 60,000 students. The city predates Anglo-Saxon times and was known in Brythonic as Tigguo Cobauc, meaning ‘Place of Caves’ (known also as ‘City of Caves’). There are over 800 recorded caves beneath the city with lots more to be discovered. Built into the cave system beneath Nottingham Castle is a contender for the title of England's Oldest Pub, supposedly established in 1189. Two other local pubs have both disputed this claim. No stranger to major events, the city hosted the 2012 Queen’s Diamond Jubilee, 2014 GB National Archery Finals, the pre-Wimbledon Nottingham Open tournament, and Mixed Relay Triathlon; as well as being home to the UK's largest urban beach, annual Splendour and Riverside Festivals, and the world-renowned Goose Fair. In 2015 Nottingham was crowned Home of England Sport – unsurprising as Nottingham is home to the world's oldest professional football club, Notts County, which was formed in 1862. The town's other football club, Nottingham Forest, had a period of success between 1977 and 1993 winning the First Division, four League Cups, a UEFA Super Cup and two European Cups. The clubs are the two closest grounds in The Football League with just 415m between the centre points of the two stadia. These in turn are a short step away from Trent Bridge Cricket Ground.